The posted coordinates are for parking. Located near the Grandville Water Treatment plant. Your gameplay will occur along the scetion of the Kent Trails Recreational Trail that extends from Jenison, MI to the John Ball Zoo in Grand Rapids. To find the actual location of the container - you must play and complete the "Kent Trails Too" Wherigo Cartridge. Once you complete the cartridge you will be provided the necessary information to find the actual geocache container and to sign the logbook. Wherigo is a new way of utilizing GPS technology to play games, take tours, and yes geocache. Visit Wherigo.com to learn more about this new software. 1. 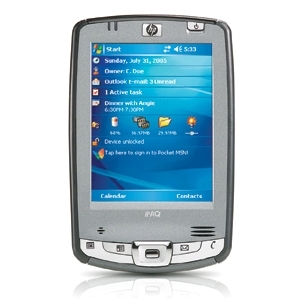 The Wherigo Player on Wherigo compatible Hardware. 2. The "Kent Trails Too" cartridge. 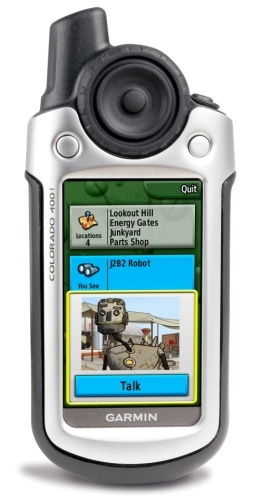 The Wherigo Player comes pre installed on the Garmin Colorado & Oregon series GPSr units. A version of the player is available for download for use by GPS enabled Pocket PC devices or certain smart phones. Click "Download Player" to get the PPC version. Once you have the Player ready to go, you will need to download the cartridge for this cache. Click "Download Cartridge" to get it. The coordinates listed above are are good place to park your vehicle while you are riding, walking, roller blading or cross-country skiing this Wherigo. . 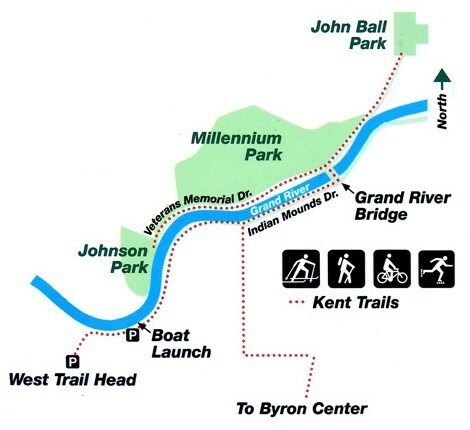 In this Wherigo, you will be traveling down a section of the Kent Trails recreational Trail that extends from Jenison, MI to Grand Rapids, MI. Along the way, I will be pointing out a few of the sights of interest and providing some history to add to your adventure along the trail today. I have ridden this trail dozens of times and find it to be quite peaceful and scenic. I hope that you enjoy your trip as well. Please note that at certain times of the year, portions of the trail may be flooded by the nearby Grand River. Please plan accordingly. Once you complete the cartridge, you will be given the coordinates to the final location of this geocache. Once successful finding the container, you will be able to log this Wherigo geocache. Is logging my result any different for this cache? Logging your results here on geocaching.com is no different than any other cache so no changes there. However, you get a new icon on your profile page. Unlocking the cartridge on Wherigo.com is not required, but it would be greatly appreciated. After you've completed the cartridge you should see a "Kent_Trails_Too.gws" file on your device. On your Garmin Colorado or Oregon you will find it in the Wherigo/Saves directory.Upload that file to the Wherigo website. You may also review the cartridge by choosing Write a Log. Once you successfully complete the cartridge and find the geocache, write a log entailing your adventures by revisiting the cache page. Thanks for playing our 7th Wherigo cache. Comments welcome of your experience. Or fher gb cnl nggragvba gb lbhe fheebhaqvatf jura evqvat!